Intramuscular Stimulation (IMS) is a comprehensive system for the diagnosis and treatment of myofascial pain. IMS is grounded in modern Medical Science, and has a solid foundation in its neuropathic model of pain, which is now supported by latest research on chronic pain. The goal of treatment is to release tight muscles, which press on and irritate nerves, tendons and joints.. Super-sensitive areas can be desensitized, and the persistent pull of shortened muscles can be released. IMS, in effect, treats the underlying neuropathic condition that causes the pain. When competently performed, IMS has a remarkable success rate, as proven by the amelioration of symptoms and signs, even for chronic back pain with root signs. IMS relies on a thorough physical examination of the patient by a competent practitioner, trained to recognize musculoskeletal dysfunctions and signs of neuropathic pain. The treatment involves dry needling of affected areas of the body with very thin Acupuncture needles. The needle sites can be at tight muscle bands, or they can be near the spine where the nerve root may have become compressed and irritated. 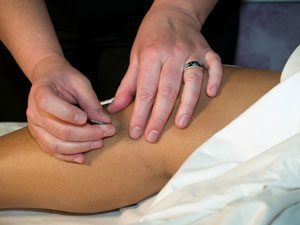 Needle penetration is painless; however, a shortened, super-sensitive muscle will ‘grasp’ the needle in what can be described as a cramping sensation. The needling and subsequent muscle response allows the muscle to relax and restores normal nerve function. Additionally, the treatment triggers repair response in the needled tissue, allowing healing to occur. We offer IMS treatments to patients from Port Coquitlam, Port Moody, Coquitlam and Pitt Meadows. Most patients who experienced IMS would agree that it is not “pleasant” and can be quite intense. However, the treatment is fairly short and post-treatment soreness is usually very mild. The benefits from treatment easily outweigh any temporary discomfort; it is extremely rare that the patient would not agree to perform subsequent IMS sessions. Most patients get full benefit within 6-12 sessions. It is not uncommon to achieve complete resolution of symptoms within 1-2 treatments as well. Should IMS be combined with other treatments? IMS often works the best as stand alone modality. However it must be noted that in order to make sure that symptoms don’t come back, rehabilitation exercise program should be initiated. Is there additional charge for IMS treatment? No. Regular Physiotherapy fees apply. No. They are different. Acupuncture works on hormonal balance and helps to reduce pain and inflammation in the entire body. It also has general relaxation and well-being effect. From our clinical experience Acupuncture works very well in states of acute pain or ongoing inflammation. IMS is a treatment for chronic pain and muscle dysfunction.